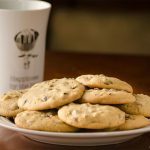 Chocolate chip pecan cookies are soft batch cookies with a rich cinnamon and brown sugar flavor. They fill your house with the scent of homemade cookies drawing everyone out of their rooms. Try switching out the pecans for walnuts for a new flavor. My husband has been asking for cookies all week…but it didn’t happen until today. I had to ward off a couple of my kids from eating all the chocolate chip pecan cookie dough. They think they’re sly wee beasts, but finger swipes across the dough don’t lie. It seemed like everything got in my way of making cookies. I persevered. Soft batch cookies with a rich cinnamon and brown sugar flavor. They fill your house with the scent of homemade cookies drawing everyone out of their rooms. Try switching out the pecans for walnuts for a new flavor. In a mixer, combine the brown sugar, maple syrup, and butter until it becomes a creamy consistency. In a separate bowl, combine the flour, baking soda, salt, and cinnamon. Alternating, combine the dry mixture, then egg, dry mixture, egg until mixed. Fold in or slowly mix in the pecans and chocolate chips. Place cookie dough in the freezer for 25 minutes or in the refrigerator for at least an hour until the dough firms up enough to handle easily. Roll dough into 1 inch balls and place onto a cookie sheet 2 inches from edges or another ball (12 / batch, typically). Bake at 325 degrees for 14-16 minutes, allow cookies to cool on a cooling rack for best results.